Kunwar Viyogi had put a powerful impact on Dogri literature and his pen captured complexities of societal norms, passion for freedom and self-determination, zest for life, deep compassion for women with such ease and grace that it reflected in his distinctive style of narrative which was free from pretension and replete with simplicity. 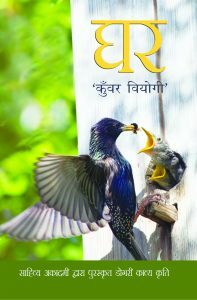 Kunwar Viyogi wrote ‘Ghar’ (Home) in the year 1980. He used ‘Ghar’ as a peg and strung together 238 four lines verse embracing a wide variety of subjects and ideas and feelings into a long poem. Kunwar Viyogi created his original masterpiece – Pehliyaan Banga, a book of 200 Dogri sonnets at a time when this form of poetry was unheard of in Dogri and was considered a forte of European literature. A magnanimous stream that attempted to introduce new and uninhibited form of literature, ‘Pehliyaan Banga’- a historical achievement in Dogri, was also the poet’s attempt to rid the language of its claustrophobic garb. Kunwar Viyogi’s sonnets are aesthetically composed, lucid, simple and somber. 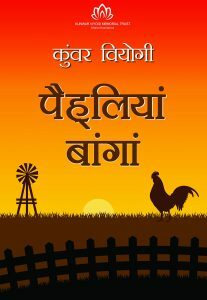 ‘Pehliyaan Banga’ is a testimony of Kunwar Viyogi’s simple and carefree views that translate his deep and true discontents and triumphs. It creates a complex depiction of love, hope, joy, wisdom, defiance, bravery, arrogance and brutal honesty. The poet comments on social norms, explores the struggles of human existence and shares life lessons that are wise and tongue in cheek. The comprehension is sharpened by life that is written with a masterly control on meter and language, steeped in love and wisdom. 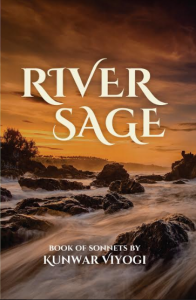 Another gift from an indomitable River Sage is a curated anthology of select 45 sonnets, passionate writer and poet, Kunwar Viyogi, to the literature world is River Sage. The sonnets penetrate our consciousness most easily almost like thoughtless thoughts and the subsequent stirrings simply grip and entice the soul. Rosary of Sonnets: Year 2018 also saw publication of Kunwar Viyogi’s work in English. ‘Rosary of Sonnets’ – a two volume anthology of more than 300 Sonnets. He writes of wringing life worth living out of the dismal bounties he was bestowed. He brought forth the pathos and joy of a romantic, ferocity of a social reformist, wisdom of gentle soul bouncing through the turbulent waters of life. Apart from the work that is published and enjoyed by mass, the ‘Father of Dogri Sonnets’ has following 1016 unpublished works which include novels, stories, poems.